The PD Dante is a portable and powerful Dante/AES67 AoIP network analyser. Small and light enough to be held in the hand, it allows up to 64 channels of audio to be monitored both audibly on internal speakers or headphones and visually on meters. A 5” full colour touchscreen is used for control and all displays. Stereo inputs and outputs are provided in both analogue and AES3 formats; the inputs may be routed to any Dante channels. For permanent installation in OB vehicles or fixed installations, the RD Dante provides all the facilities of the PD Dante in a 2U 19” rackmounting unit. RD Dante has dual redundant power supplies and a pair of 3” diameter loudspeakers for improved audio quality. 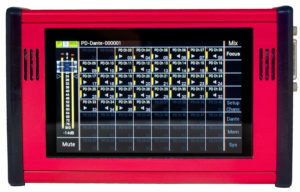 The Nixer PD Dante is an indispensable tool for broadcast or live sound engineers installing, configuring or simply using a Dante AoIP audio network. It allows the engineer to rapidly inspect all aspects of the network and to diagnose any problems, without the need to access any of the Dante devices already on the network. It includes a powerful set of network configuration functions which effectively lets the unit be used as the system controller. PD Dante connects to the network with a standard RJ45 cable and is then recognised by the system’s Audinate Dante Controller software as a network device. Once established on the network, PD Dante will then display the name, status and audio level of all audio channels in an easily-read layout on the unit’s touchscreen. Physically, PD Dante is very light and compact and is essentially a hand-held device. It will operate from a PoE source if the network connection is so enabled, or from an external DC PSU (supplied) if not. All user interaction is through the 5” high definition, full colour touchscreen, which displays all network and audio information as well providing an easy-to-navigate, menu-based control system. The main screen displays network status for both primary and secondary ports together with clock rate. The status of all audio channels is displayed, with channel number, name and bargraph level meter for each. Any channel may be routed to the unit’s monitor outputs: L, R or L+R (the routing is indicated on the display) and will then be audible on the two internal speakers, or on headphones connected to the 3.5 mm headphone output on the side of the unit. Connecting headphones mutes the internal speakers. The level of the sum of selected channels is displayed on a large stereo bargraph meter: both this and the individual channel meters have a user-selectable peak hold function. Monitor volume and mute functions are provided. A powerful PFL mode permits monitoring of adjacent channel pairs with one-touch operation: additive PFL may be selected as an alternative. Further display pages provide enhanced metering/monitoring of 8 or 16 channels, with swiping capability to allow inspection of all channels. Large-scale metering of an individual channel is also available. PD Dante also provides a Solo function and one-touch routing of all channels to L or R, or of all odd-to-L/even-to R routing. A Focus function allows the user to highlight any subset of audio channels, simplifying the display if the interest is in only certain channels. 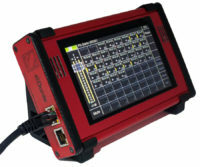 The monitor output is also available for external use: both a pair of balanced analogue line outputs and an AES3 digital output are available on a Dsub connector. PD Dante also allows the user to inject signals into the Dante stream: an AES3 digital input is provided on the Dsub connector and there is also an unbalanced analogue input (with level control) on a 3.5 mm jack socket. The inputs may be routed to any odd/even channel pair. The unit is also compatible with iPhone® headsets, letting the engineer monitor the system audibly while injecting using a speech signal. A Dsub-to-XLR breakout cable is available as an accessory. The GUI includes numerous further pages which give the engineer an overview of network information, control of meter setup, Solo setup, and other “housekeeping” functions. A very useful feature is the inclusion of a test oscillator which generates sine, square or triangle waveforms at eight frequencies from 50 Hz to 10 kHz, plus white or pink noise. The oscillator output can be routed to any Dante audio channel(s) and/or to any of the unit’s outputs. 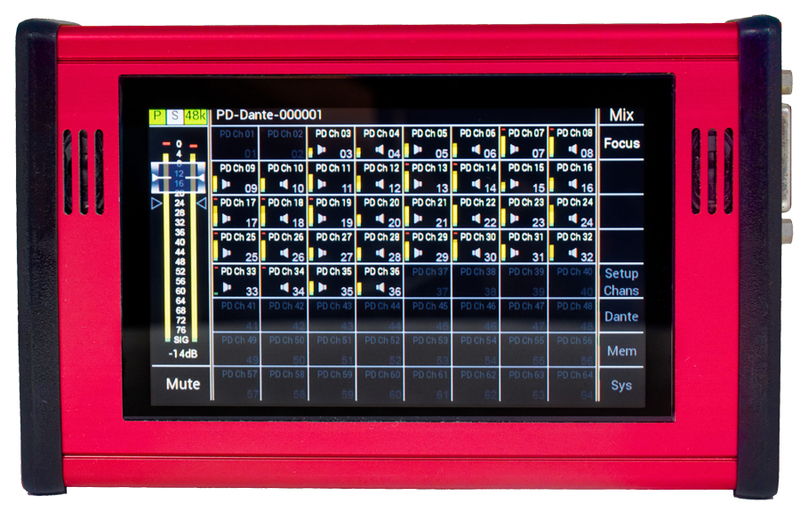 PD Dante is AES67 compatible, and will operate on Dante networks of 16, 24 or 32 bit depth, working at 44.1/48 kHz (64 audio channels) or 88.2/96 kHz (32 audio channels). It is also fully compatible with Audinate’s New Dante Domain Manager software. Although primarily a portable unit, PD Dante may be fixed to any convenient surface with a pair of optional mounting brackets; a pre-drilled 19” 3U panel is also available to permit rackmounting. A further mounting option is a sloping desktop stand, which allows the unit to be angled at 30° or 60°.